Each plan contains all the construction drawings & FULL SIZE FRAME PATTERNS WOOD EPOXY or CUTTING FILES for STEEL or ALUMINUM construction, plus bonus drawings covering electrical, plumbing and engineering, everything you need to build your boat. You can view & print the drawings in full or in sections. BUILDING PHOTOS are included in the plan package. PLUS you receive a FREE (value 79.95) e-book BUILD YOUR OWN SAILBOAT. Only available at this price if you order off this page. WOOD EPOXY boat plans AND FULL SIZE PATTERNS. This new robust go anywhere at any time - radius chine serious cruising sail boat is based on our New York 65 many of which are sailing the oceans of the world. This new design is available in KIT form or custom CUTTING FILES. We can design custom sail and accommodation boat plans to suit your particular requirements. Pre cut boat kits are all the metal parts required to build a complete boat. These parts are computer generated and NC Plasma cut before they are packed and delivered ready for you to start assembling and welding into the finished boat. We design and nest the package using our specialized computer programs, then cut on a computerized plasma-oxygen cutter. For example, an 13m ( 43' ) yacht would comprise of around 470 parts! These kits are shipped world-wide, each in individual containers. These cruising sailboats are designed in accordance with Lloyds for category 1 (unrestricted operating / sailing area), which is much better than the EU and other Classification Societies and the CE-A require. Complete stability calculations to USCG offshore requirements are included in the design package. All calculations are also cross referenced against ABS requirements to ensure that the design meets world-wide standards and specifications. CUSTOM INTERIOR LAYOUTS are available for this design. This design will accept a variety of rigs - Cutter headed Ketch shown. - GIVE ACCESS TO MANY step by step BOAT CONSTRUCTION PHOTOS + PHOTOS OF COMPLETED BOATS ETC. 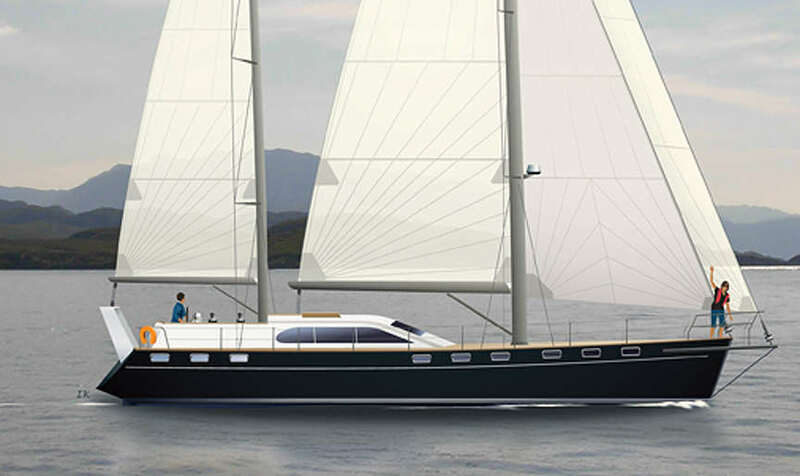 This new design will accept a variety of rigs - Cutter headed Ketch shown. This charter layout is only one of many possible accommodation lay-outs for this fine cruising boat.